Jordan is a twenty-one year old musician from Edmonton, Alberta. He has been exposed to music since he was just a young boy, and knew very early on that it was what he wanted to devote his life to. His uncle, Chris Hartman, was the piano player behind the famous Canadian country band Emerson Drive, and has been a huige inspiration for Jordan throughout his entire life. “My family is extremely musical, especially my extended family. Everytime we would go to see my grandparents or my uncles and aunts, there was always a guitar out, no matter what we were doing. By the time I figured out I could pursue it as a career it was already so embedded into who I am that there wasn’t really another option for me,” he says. He began to chase his passion after participating in a singing contest at high-school in tenth grade. He had entered with no greater expectation than getting through the first round, and still recalls the shock of hearing his name as they announced the winner. “I made it through the first round, past the second round, into the quarter-finals, into the semi-finals, into the finals, and then I won. The experience of being a freshman in this new high-school and having the attention of all my peers and having them cheer me on was absolutely intoxicating,” he says. From there, Jordan decided to enroll in the Victoria School of The Arts, in Edmonton, to follow and develop his passion for music and performing. As his talent was soon recognised by his school, he received a scholarship to attend a five-week summer performance program at the Berkeley College of Music, in Boston. “I was absolutely floored by the talent down there. There were people doing stuff with their voice that I didn’t even know was possible, and I would spend like six to eight hours a day in a practice room, just trying to hit the notes that they were hitting over and over and over, until I blew up my voice. I did that every day, for five weeks,’ he laughs. After that, Jordan pursued a music degree at MacEwan University, but found he clashed with the curriculum. So, he decided to strap a guitar to his back, pack a backpack, and go roaming around North America to play music for people. 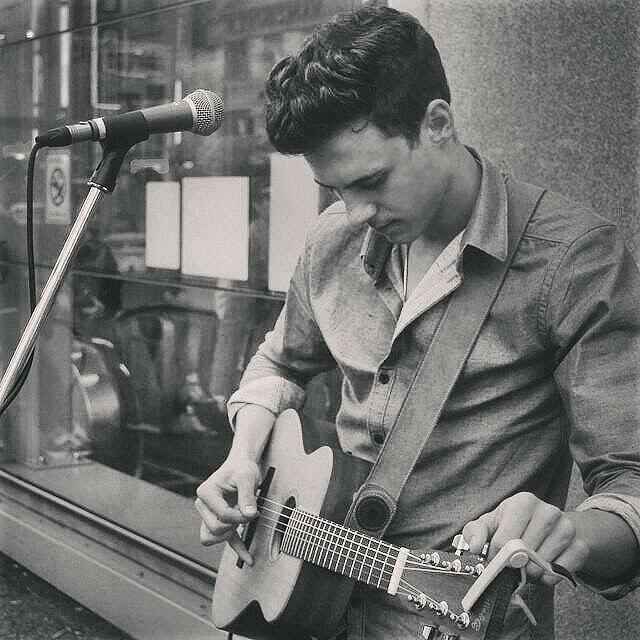 So he drove to Vancouver, busted out his guitar, and started busking. On his first day out on the street, he was approached by Leigh Angman, the owner of Relish Gastropub and Bar, who invited him to perform as part of a regular Thursday night event. The shows were incredibly successful and grew on a weekly basis. One night, Bryant Olender, a local pianist, songwriter, composer, and performer, was walking past Relish and heard Jordan performing inside. He entered, and introduced himself. The two of them kept in contact, and Bryant proved instrumental in introducing Jordan to a number of other venues across the city, including Gotham, multiple Fairmont Hotels, and the Shangri-la. As Relish approached its tenth anniversary, Jordan was invited back to the pub to perform at the event. Among the crowd on the night was Geoff Goddard, Managing Partner and Co-founder of Frontside Group, one of the largest artist promotion and radio marketing companies in Canada. Geoff was quick to realize Jordan’s talent, and took it upon himself to introduce him to Ryan Stewart. Ryan is a Juno Award-winning, multi platinum-selling songwriter and producer of Carly Rae Jepsen, Victoria Duffield, Bif Naked, Andrew Allen, and others, based out of North Vancouver. “From the moment I heard him the first time at Relish, I knew that Jordan had the vocal and musical talent to have an impact within the Canadian music business and beyond. After the show that night, I met him and something else I really like about him is that he’s just a really nice guy. We’re excited about Jordan’s future and Frontside is proud to be a part of that,” says Geoff. Ryan was eager to work with Jordan, and co-produced two of his latest tracks, Body Language and Break away. After hearing the sound that came out of those recording/production sessions with Ryan, Frontside Group signed Jordan as part of a radio and artist promotion deal. 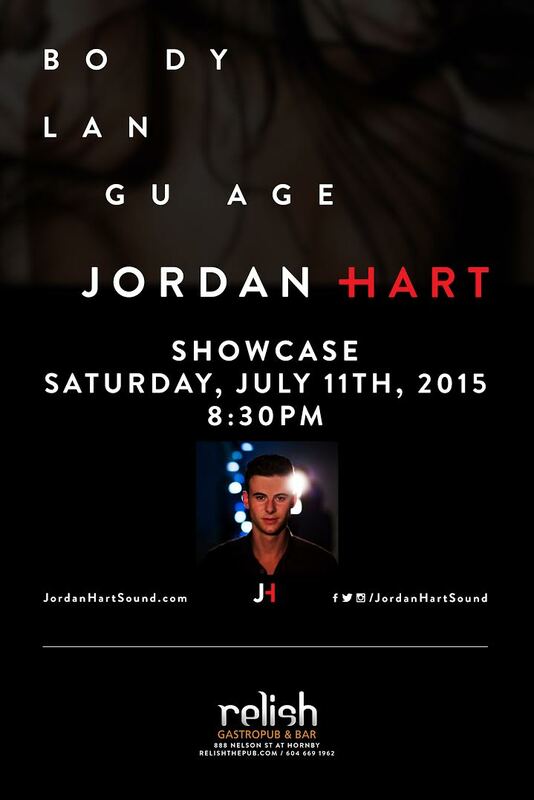 Jordan will be performing once again at Relish Gastropub and Bar on Saturday, July 11th, to promote the release of his new promotional video (above) and give his audience a sneak peak at his upcoming EP “Break Away,” and the radio release of one of his tracks, Body Language. The show will mark the beginning of what is sure to be an exciting new stage of Jordan’s career, and serves as a way for him to showcase his talent and his latest material to his listeners. It will provide Jordan with the opportunity to get in touch with so many of the people who have supported his career over the last year, and also reach out to new fans and show them what he is capable of. “I’m really excited to have everyone there, and have the opportunity to perform in front of people and show them how I am growing as a musician and performer, and that things are happening. It’s gonna be a huge night for me, it’s gonna be an amazing experience,” he says.